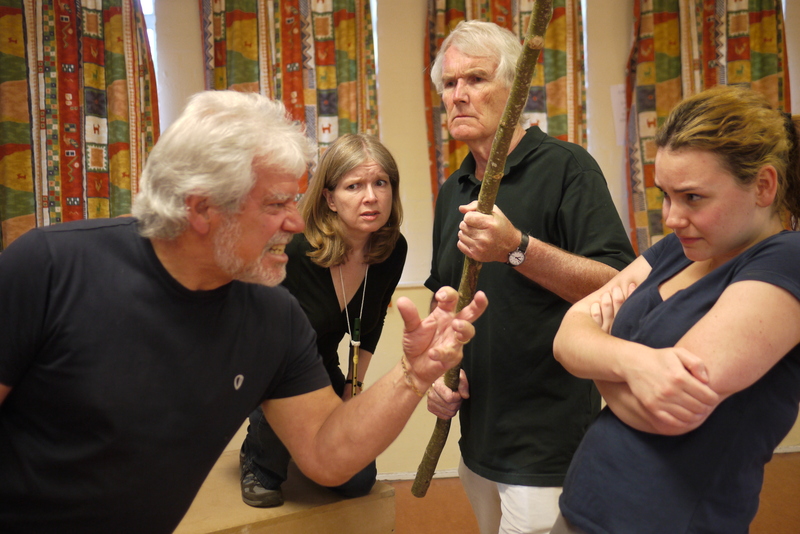 Three weeks tonight we open Shakespeare’s Tempest at the Alton Maltings Centre. 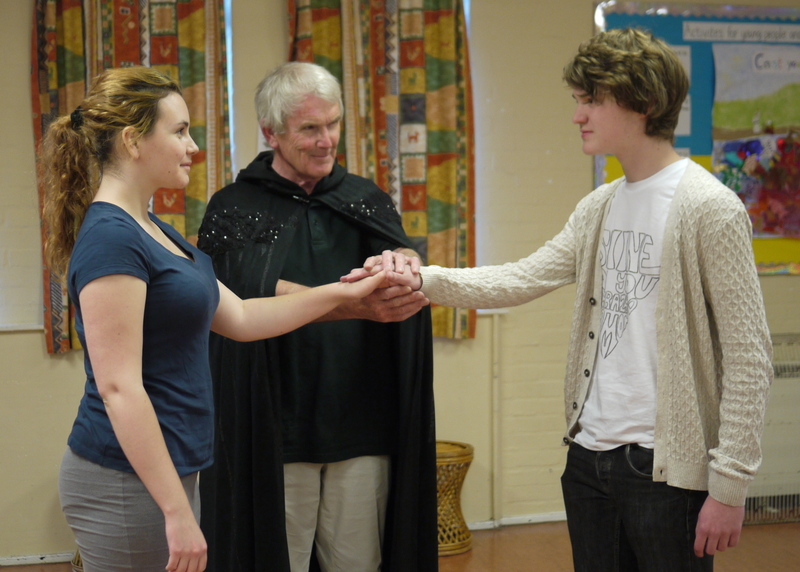 We took some publicity pics at yesterday’s rehearsal – some for the local paper, and some for our website. What an incredible privilege to be getting to know and performing these fabulous words. Five of us drove up to Shakespeare’s Globe on Sunday evening, parked free in the street nearby and stood right in front of the stage as ‘groundlings’ for what is still that amazing £5.00. Which must be one of the best entertainment deals anywhere in the world. We were transfixed by the superb performance, and me especially by Roger Allam‘s quite wonderful Prospero. We came back bursting with enthusiasm and inspiration for our own, so much humbler, but nonetheless valid in its own way, effort. I am of course immersed in the play. I go through my entire part every day. I am getting quicker because I don’t have to check for accuracy so often now, but it still took me an hour and ten minutes this morning. I walk round and round the lawn in what has been, at long last, glorious sunshine. And I never tire of the beautiful words with their endlessly emerging layers of meaning. One thing that is fascinating me is the way the language Propero uses in addressing his two servants evolves during the play; his symbolically contrasting, light and dark ‘slaves’, Ariel and Caliban. It seems to me that this aspect, which I haven’t found much commented on, is really important. He begins by treating both of them with a chilling autocracy, and sometimes with real cruelty. “Thou liest, malignant thing” he says to an abject Ariel in Act 1 Scene 2. “Thou poisonous slave, got by the devil himself upon thy wicked dam” to Caliban in the same scene. And then at the final parting, at the very end of A5, the last words of the play apart from the Epilogue: “My Ariel, chick […] then to the elements be free, and fare thou well“. I hope we can make this the touching moment it deserves to be. He is now a person, a ‘sirrah’. Caliban responds with a contrite determination to be wise henceforth, and all Prospero says in parting is: “Go to; away!“. It could be peremptory, unforgiving. But at the Globe, Roger Allam said this very slowly, and momentarily touched Caliban. That made all the difference, and that is how I am doing it now. So we have this theme of growth towards freedom, culminating, of course, as its third element, in the famous Epilogue, in which Shakespeare seems to be saying his own farewell to the theatre. Freeing himself of that burden, as burden it must have been. Building on the wonderful ‘cloud capped towers’ speech A4 which makes my spine tingle to think about, let alone to actually perform. And again, very near the end, “...thence I will retire me to my Milan, where every third thought shall be my grave”. That’s enough of me thorts for another few days. But even if nobody ever reads this, I wanted to write this down.